U.S. says al-Shabab drone/manned aircraft strike killed 150 in Somalia. 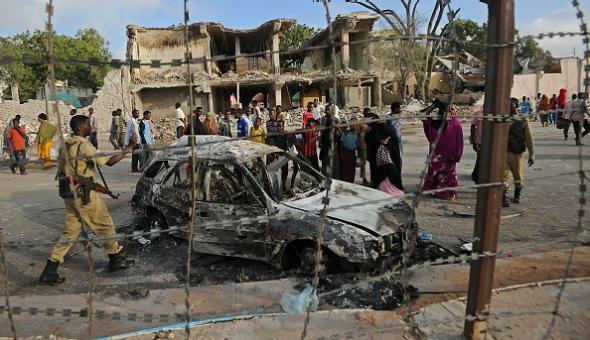 The wreckage of an al-Shabab–claimed attack in Mogadishu in a photo from Feb. 27. [Davis] would not specify the location of where the U.S. thought an attack might happen, but it is well-known the U.S. maintains a small military presence at the airport in Mogadishu and that small numbers of U.S. special operations forces have traveled to other locations in the country. Al-Shabab at one point held a number of urban areas in Somalia, including parts of Mogadishu, but has been driven out of the capital and other cities and towns in recent years and now primarily operates via terror attacks. The organization, which is allied with jihadist groups including Boko Haram and al-Qaida, still has a significant rural presence and has frequently been targeted by United States drone attacks. The attack announced Monday appears to be the largest operation, in terms of death toll, that the U.S. has carried out in Somalia since the Battle of Mogadishu (i.e. the 1993 incident depicted in Black Hawk Down).